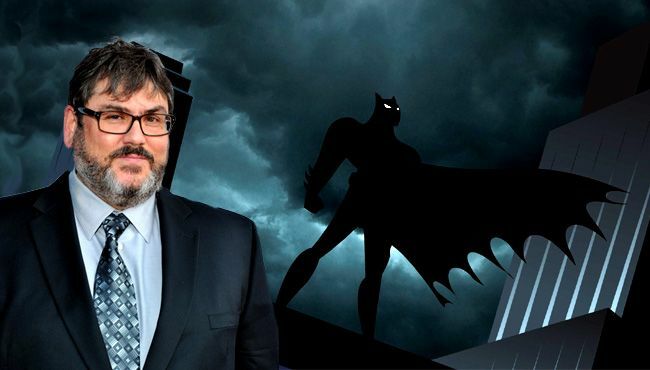 Anyone who is a fan of Batman knows the name Paul Dini, and even if you’re a moderate fan, chances are that his work has come to your attention at some point. After all, he is the co creator of Harley Quinn, who’s popularity is at an all time high. Paul Dini was a principal figure in shaping the world of Batman: the animated series. He wrote arguably the best episodes, none the least being ” Heart Of Ice.” He went on to write more Batman while working on Batman Beyond and Justice League Unlimited. Clearly the man knows Batman. 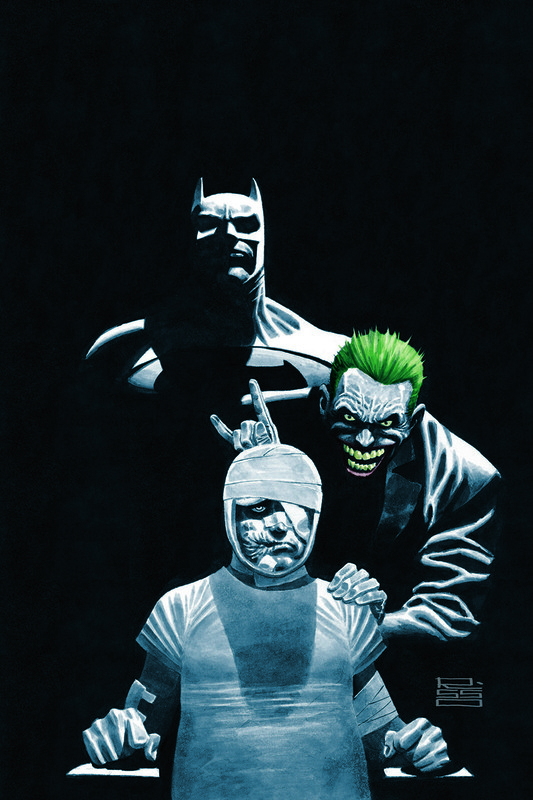 His latest effort ( Dark Night: A True Batman Story) dives back into the world of Batman… Sort of. It’s actually a real life account of a terrible time in Paul Dini’s own life. One night during the 90’s Paul Dini suffered a brutal attack at the hands of muggers in L.A. The attack was so bad that he was beaten to within an inch of his life. This graphic novel tells that tale and the work it took to overcome his demons and move past his ordeal. It’s a surprisingly naked look at Paul Dini’s personal life and all the problems he had before AND after the attack. Where does Batman come in? Dini uses Batman and the world around him as a further exploration of his psyche. Sort of like the angel ( Batman) and the devil on his shoulder( Joker). Let’s dive in and dissect it a bit further. It”s essentially a recounting of parts of his life. Right off the bat, the first panel is a full page spread of Dini lying in a hospital bed. His face and head are covered in bandages. We start with a brief glimpse into Dini’s past when he was growing up as a child. We discover that Dini had confidence issues and because of this he developed a vivid imagination to make him feel happy and safe. Perhaps it’s thanks to this imagination that Dini is able to write his characters so truthfully. We get quick flashes forward in time and see the progression of his career. Eventually we get to the time when he was at his peak in terms of success, but even throughout this time he lacked the complete fulfillment he desired. Finding true love and companionship being his biggest hurdle. It’s a treat to see Dini working at the Warner Bros. office and interacting with his co-workers during the height of Batman T.A.S. These moments are fleeting as the focus is always on Dini more than anything else. Even at this time Dini’s imagination would run wild. Every now and then you would get a panel of Batman popping in or an animated bird etc. These cartoons were very real to Dini. He knew they existed in his mind but they felt real in some way. He loved these characters and perhaps was guilty of using them as a safety blanket from the outside world. Once we get to the night of the mugging we’ve sat in his skin along with him to understand the full extant of the psychological ramifications of said mugging. The attack itself is a haunting ordeal, both for him and the reader. Every moment is captured with stark realism. It’s ugly and unnerving. The viciousness of the attack was one thing, but the evilness was what really shook me. I forget how truly despicable people can be sometimes. You hear about this kind of stuff all the time but this time we saw and heard it, practically reliving it with Dini. I suppose I felt as if I almost knew the person this happened to. Sure, I’ve never met Paul Dini but I’ve known of him for years. Not to mention the fact that he’s one of my favorite writers of all time. I respect him. To know someone I respect and admire so much got the living hell beat out of them like that saddened me, let alone seeing it. I couldn’t help be overwhelmed with anger and sadness. Imagine how Paul Dini himself felt? In actuality, we didn’t have to imagine thanks to his gut wrenching writing. The story takes you down every dark turn in his scarred psyche. Batman and Joker remain at his side throughout the whole ordeal. Batman, more of a stern father figure than a consoling shoulder to cry on. He insists that he get back up and move forward. Face the outside world and don’t let the bad guys win, that kind of thing. Joker tries to be his friend telling him to stay in the confines of his safe home. There rest of the time he simply laughs at Dini, telling him to give up. There are times when Batman berates Dini for not being smart or strong enough to handle the situation better. There’s a poignant moment where after Batman berates him Dini tells him ” You weren’t there to save me. I don’t believe in you anymore.” How could he? And how could he be expected to write a character he doesn’t believe in? It’s important to mention that this happened in the middle of writing the animated movie, ” Batman: Mask Of The Phantasm.” The journey to take back his life is a long and painful one but it’s execution is excellent. It’s a truly engaging story that i couldn’t put down while I was reading it. Full marks have to go to Eduardo Risso for this project. I believe he may have put out the finest work of his career, it’s certainly the most varied art I’ve ever seen from him. We get many different flavors from almost, panel to panel. He brings his unique gritty style, made famous while working on 100 Bullets. He also delves into a stripped down cartoon style for some of the lighter moments. During the narration scenes of past and present we get a painted water colorish style. Risso manages to pull all these styles of convincingly, as if he’s always done them. He really nails it in the attack scene. It’s chilling but tasteful. You see just enough without going into gory detail. The words tell the rest. Even Paul Dini, stated that Risso captured the attack scene so well he couldn’t look at it for a week after. The colors also play a big part. Without a masterful use of colors, many of the surreal moments could come across wrong. Thanks to the creative effort here, everything fits very well and is easy to follow. It’s a stunning piece of work that should not be overshadowed by the rich story. Dark Night: A True Batman story is really a Paul Dini story that uses Batman in a way that has never been done before. In many ways he’s more real than ever and in other ways the opposite. As the story progresses you come to realize, as Dini did, that Batman is more about what he represents and what that means to people. At the end of the day, characters like him mean a great deal to many. They help to get people through pain, and in some instances inspire them to become greater than what they are. Paul Dini once received a letter from a Police Officer who told him that Batman T.A.S inspired him to become a cop. No, Batman isn’t real, but he can inspire real emotions and actions. It’s not just one story either. It’s the culmination of all the special ones that do that, and Paul Dini played and part in making that happen. As we discover from the book, it took a great deal of soul searching to discover that, let alone believe it but he got there. In it’s simplest form, this story is about trauma and how to get through it and come out okay. It’s a cathartic experience for the writer but it can also give hope to anyone going through a tough time. It can only work and seem genuine if it’s honest, and it is. In fact it’s honesty is it’s greatest strength. Dini puts it all out there for thousands of people to judge him or not. That’s an incredibly brave thing to do. The book is a dark read but it does provide moments of levity from time to time. Even the ending is of a brighter tone. It’s not for kids but I don’t think it was intended to be. I can’t recommend this book enough to fans and non fans alike. Survival, redemption and self worth are just some of the many themes explored in Dark Night. Does it have people in funny masks and capes? Yes. Can they be silly? Yes, but never have they felt more important. Perhaps one person’s drivel is another persons salvation. I think Paul Dini would argue the latter for himself. As for Paul Dini, one question he asks himself is does he matter? My answer is yes, you do. Thank you for writing this and many other stories that continue to entertain and enrich lives. leave it to Paul Dini to write one of the most important stories I’ve ever had a chance to review.